At 6 p.m. on August 2, 1977, I boarded a Greyhound bus leaving Philadelphia, heading south. I awoke the next morning to a window filled with a landscape of red dirt and cotton fields stretching to the horizon. Oak trees stretched their branches over poor farming homes, as if nature was trying to softly embrace the families inside. I was just starting on the second month of my bus tour through the United States. I arrived in Atlanta at 3 p.m. the following day, excited about beginning my photo tour of the Deep South. I was traveling to the South because I wanted to photograph black people. I wanted to photograph America, but an America that I didn’t know. The black people I had seen in photographs and movies mostly lived in urban ghettos in large cities in the North and West. They had all been defeated by — perhaps incorporated into — the realities of urban life. But I had heard in recent years that many blacks were returning to live in the South. 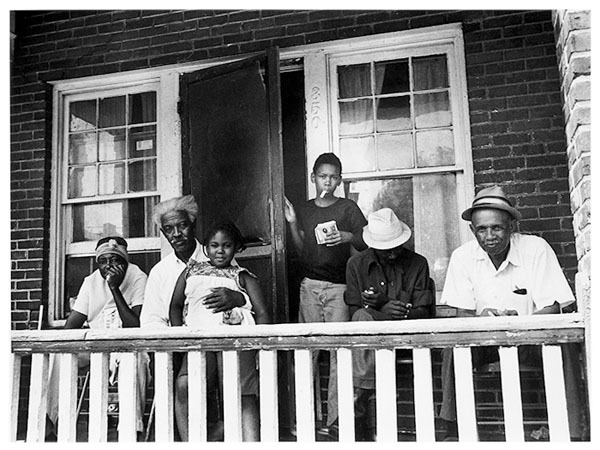 Most blacks living in the industrial cities of the North were originally from Georgia, Alabama, Mississippi, Louisiana, and other southern states. Many had moved to the North with dreams of finding work and escaping discrimination. With the end of slavery in 1863 came the end of reliable food and shelter for many who remained in the South, which in turn forced them into a difficult life as sharecroppers for whites. The mechanization of farming after World War II forced millions to move to the industrial areas of the North. Relocating to the north in pursuit of freedom, equality, and work, most blacks found only unreliable work and low wages. They lived in small, dirty, over-priced rented dwellings. Their children attended poorly equipped, low performing schools. Conditions in such communities inevitably encouraged the evils of crime and drug addiction to rise and flourish. Just as hope once pointed the way northward, did it now lead them south again? Was the situation desperate enough to warrant this return to persistent poverty and discrimination? I hoped to answer these questions as I photographed the new life in the old South. First thing the next day I went to visit the church of Dr. Martin Luther King, Jr. I asked the congenial looking white man selling tickets at the bus stop for directions to the church. “Whatcha want to go there for?” he answered, refusing to help me. “You wanna become a wino or something?” Perhaps he didn’t like the idea of me going to the “black” area of town, imagining it a kindness to prevent me from going there alone. Setting off on foot, after one block the number of black people increased, and after two blocks I was the only non-black person in sight. The cityscape was crumbling bricks and rough, grimy concrete buildings. Men sat under trees, drinking liquor from the bottles they clung to. By the time I found King’s church on a deserted corner, I noticed the cheerful expressions of the drinkers surrounding me. I realized that I wasn’t on edge, like I had been in certain areas of Chicago, or in Harlem. In Los Angeles and New York I confronted drug addiction and mental illness. I had read that the crime rate was getting worse every year in southern cities. I wondered if Atlanta would continue that trend, eventually developing slum districts like those of the large northern cities. After a week of walking through Atlanta’s downtown, I visited the offices of the Atlanta Journal, the larger of the two Atlanta dailies. Hoping to begin my research on black people returning to the south, I had previously contacted them by letter. They responded with two phone numbers. I met with Milton Lincoln, director of the Atlanta Chamber of Commerce. He spoke very precisely and clearly, had a certain snap to his movements. He possessed the manner and sharp eye of an educated businessman. Entering his office, the first thing I noticed was a large color picture of his wife and two daughters, smiling faces beaming at me from within their frame. Apparently, American middle class professionals like to decorate their office with family photos. Mr. Lincoln was 32, born in Cleveland, Ohio. He moved to Atlanta when he was 19 to attend Morehouse College, the private, all-black university that Dr. King had also attended. Mr. Lincoln said he’d had a comfortable life in the north—his father was an executive, and his mother performed educational services for the local welfare agency. He said he had come south in search of a white-collar position. Atlanta had been growing fast, and there were many opportunities for good jobs. For a black man in the north it was difficult to find anything but blue-collar work, even with a college education. I asked Mr. Lincoln if blacks were returning to the south because poor opportunities for education and employment prevented them from escaping the ghetto. Did they come here looking for work? He replied that those coming back are mostly middle-class people in specialty fields—technicians, lawyers, doctors, university professors, and the like. He said that those blacks who made it into the middle class up north often came south looking for better positions and increased stability.